My knitting has fallen victim to my new job. Not that I have one of those exhausting jobs, but that my 9-5 is occupied and I can’t knit as much as I would like to. Before I had dedicated times of knitting. Now, I knit on 15-miniute breaks, while I’m stuck in traffic or any other moment I can steal. The problem with this is over the summer I started a number of projects to wear once the weather changed. 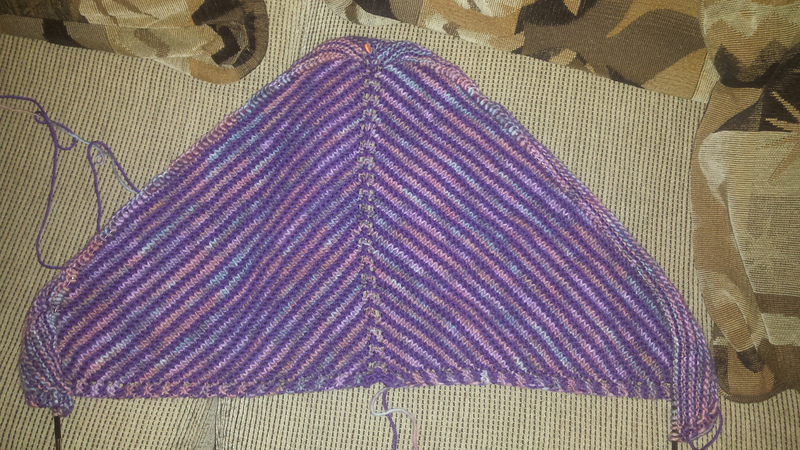 I had a sweater, a shawl and a poncho on my needles at the same time. I thought I had enough time to finish them all before now. I did manage to finish knitting two of them but I didn’t block them, and according to my husband, they’re not finished until they’re blocked. This past Sunday was my wake-up call. When we left for church, it was barely sixty degrees outside. And the building we meet in is county-owned, so the thermostat is set until someone comes and turns the heat on later this year. I nearly got hypothermia during the church service. I needed the things I knitted but they weren’t blocked. I realized the error of my ways and blocked all three garments, in addition to an item I knit for a swap partner and a scarf my husband knit. Right now, they are keeping my living room floor warm but soon, they’ll keep me warm.